The Sin Bin Sports Blog: Will Shane Doan Leave Phoenix? Will Shane Doan Leave Phoenix? Over the years, the Phoenix Coyotes franchise has been a complete mess. Since leaving Winnipeg and arriving in the Desert in 1996, the Coyotes have been shaky and seemed destined for failure. However, despite their short comings, low attendance and ownership troubles one thing has been constantly apparent, Shane Doan. Now, with Doan becoming an unrestricted free agent, it seems that Doan's 16-year career with the organization could be coming to an end. Doan did not jump into the free agency looking for a new home, he has waited, patiently, for the current ownership situation to unfold. Doan gave himself and the Coyotes a deadline of July 9th, well it's the 9th and teams are knocking at his door. Doan has expressed his desire to stay with the Coyotes, and the Coyotes have said they would be willing to offer him a one or two-year contract to hold him down while things get settled on the business side of things. However, this has not stopped the offers from coming in, and the rumor mills from starting to turn. 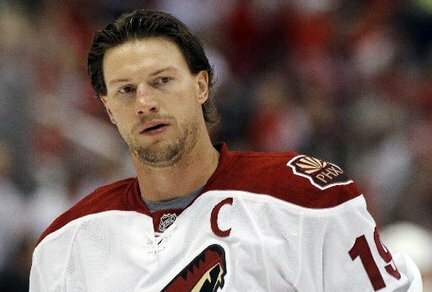 It has been mentioned that the Los Angeles Kings, Vancouver Canucks, Detroit Red Wings and Pittsburgh Penguins have all expressed interest in Doan. The addition of Doan's grit, leadership, and offensive skill would make any team a Cup contender. But if one of the teams mentioned, all strong teams already, lures him out of Arizona, they will be a force to be reckoned with. Doan has not given a deadline as to when he will decide, but if he does in fact leave Phoenix, that could be the death blow to hockey in the Desert.